Healthy Mouth, Healthy Life! : Why Does My Dentist Shake My Cheek? The Painless Injection Technique. Why Does My Dentist Shake My Cheek? The Painless Injection Technique. Focus on the results. Allow CrossKeys Dental keep you at ease during your visit. The dentists at CrossKeys Dental make it a point to make the injection as easy as possible for the patient. I use a technique that I have found to yield happier patients and Dr. DuPre՛ uses a similar process and has kept his patients comfortable for almost 30 years! Before anything else, the doctors and the staff make an effort to maintain a relaxed atmosphere and we try to gauge the comfort level of each patient so that we can help ease them through the process. · A topical anesthetic is always applied prior to the injection. I like to place the gel on a cotton roll to keep it from spreading. This helps to ensure that only the injection site is numbed and not your tongue, cheeks and lips! I also like to leave it at the site for a few minutes to allow maximum diffusion into the tissue so that there is deeper anesthesia, even before the injection. · This is not a race! I think the most important aspect of the “painless” injection is to take it slowly. Most of the discomfort is due to the fluid pressure filling the space in the soft tissue. Slow delivery accomplishes 2 things: decreased pressure, and the ability to numb the tissue immediately ahead of the needle (I know I said I wouldn’t write it, but I needed it there…) to try to keep the patient from feeling the movement. 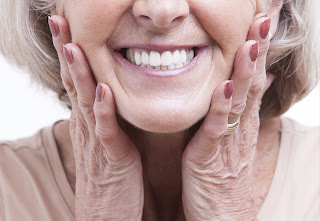 · Did you know that Novocain is a thing of the past? Most (almost all?) dentists stopped using it years ago. The anesthetics that we now use have a much quicker onset and last long enough to finish the procedure comfortably. So, how does gently shaking your cheek fit into the equation? Many dentists, including me, will often use this a distraction during the injection. While it definitely helps the patient take their mind off of the process, it is also rooted in neuroscience through a phenomenon called the gate control theory. This theory proclaims that non-painful stimulation of a site can help to “close the gate” on painful stimulation. The nerve fibers that carry touch, pressure and vibration sensation are thicker than those that transmit pain, and when they are stimulated their cells may actually inhibit transmission through the thinner, pain-carrying nerve fibers. Think of a highway onramp. Now picture the highway as the thicker nerve fibers that carry the non-painful sensation and the onramp as the thinner, pain-carrying fibers. At 10:00 AM when most people are at work there is very little traffic and it’s easy to get onto the highway from the onramp. In this situation the pain wins out. But think of all of the traffic on the highway at 5:15. At that time it’s much harder for the cars (pain) to use the onramp to get onto the highway. So, when the dentist is shaking your cheek, he or she is trying overload the “highway”, thereby blocking the pain of the injection from reaching your central nervous system. Think about it: have you ever rubbed your elbow after you bumped it? You were putting the gate control theory into action! CrossKeys Dental is located at 110 CrossKeys Office Park in Fairport. Dr. DuPre and Dr. Badali provide comprehensive family dentistry and are always welcoming new patients. Visit us at www.CrossKeysDentalFairport.com for more information. Hey, it is such wonderful article. Your dental services look just fantastic. We also need such professional services for our family’s dental care. I wonder if you know about such professional and domestic dentist Redondo Beach for our family! Leading a healthy lifestyle doesn't mean you have got to run a mile before breakfast, eat seeds and think pure thoughts. Thanks for the post. DentalSave offers some stand alone dental discount plans New Jersey to save your money. This discount plans are planned in a way that helps you to get a discount in every purpose of treatment from visiting doctors to any major surgery and investigation.